The latest of Cecilia Bartoli’s exuberant explorations of neglected areas of 17th and 18th-century opera has journeyed north to St Petersburg and the archives of the Mariinsky Theatre to examine the fruits of attempts by three successive 18th-century Russian empresses – Anne, Elizabeth and Catherine the Great – to modernise the city’s musical entertainments. ‘Modernising’, of course, meant ‘Italianising’, achieved by appointing Italian composers, singers and designers to the court opera. Famously, Catherine summoned at various times Galuppi, Traetta, Paisiello, Sarti, Cimarosa and Martin y Soler, but we get only one of those guys here, the emphasis instead being on the three less familiar Kapellmeisters employed by her predecessors in the years 1735-65: Francesco Araia, Hermann Raupach and Vincenzo Manfredini. Anyone expecting from that a diet of thin, phoned-in Neapolitan fare will be in for a surprise. There is rich music here, and dramatic too. The arias, all from opere serie, are expansive in vocal expression and orchestral colour, and crackingly good to listen to too. Araia’s ‘Vado a morir’ has a Venetian duskiness, his ‘Pastor che a notte ombrosa’ a placidly piping oboe encountering shivering violin figures suggestive of a palpitating heart; arias from Raupach’s Altsesta, the first-ever opera in Russian, show Classical poise as Alceste sacrifices herself, and scintillating athleticism and dash as Hercules prepares to enter Hell to a charivari of trumpets and drums such as surely no Fury could withstand; and the two arias and a chorus from Manfredini’s Carlo Magna include one in which the eponymous Charlemagne dispenses mercy while flute notes drop as the gentle rain. The Cimarosa, from 1788 and with a clarinet obbligato, has a more High Classical combination of vocal virtuosity and lyrical grace. Bartoli, as ever, is in complete technical command of this music, which in places is as challenging as you’ll find at this period. It is pleasing to hear that the machine-gun attack that she has in the past applied to passagework has been moderated into something more fluid; but where before a certain over-intensity of tone has sometimes threatened to crush slighter music, these arias seem well able to stand up to it – and in any case, it is nothing to the vivid excitement brought to them by her tireless expressive commitment. 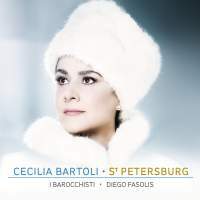 The playing of I Barocchisti under Diego Fasolis, as on last year’s Steffani arias disc (11/13), is brilliant, surging, ardent. Bartoli’s lavishly realised ‘project’ albums are regular treats. Proper research and thought goes into their selection and de luxe presentation, resulting in objects to be cherished and discoveries truly worthy of the making. Remember, it is only 15 years ago that she was performing this service for Vivaldi’s ‘forgotten’ operas, and look what has happened to them!